Alexandra Hargreaves (left), Head of Export at Lick Frozen Yogurt with Lesley Batchelor Open to Export CEO (right). On November 17 2016 Open to Export hosted the third Export Action Plan Competition final, sponsored by Heathrow Airport, Bibby Financial Services and Yell. 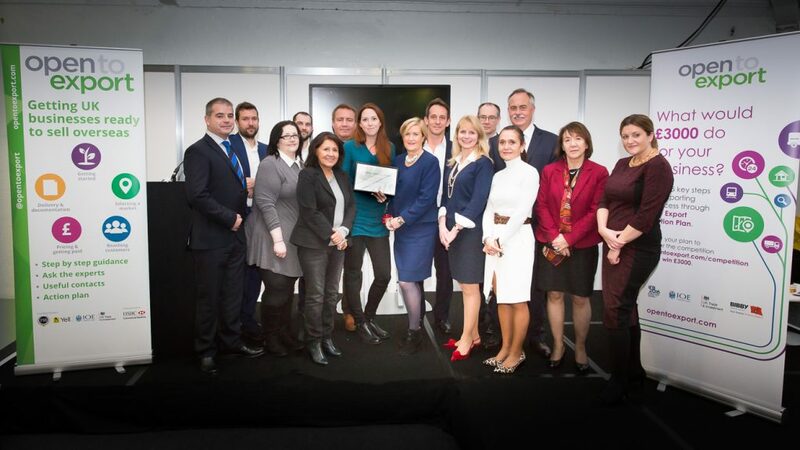 It was hosted in a dedicated awards theatre at Olympia in London as part of the Going Global business show. It was a fiercely contested competition with some great British businesses taking to the stage to pitch their export plans to a panel of expert judges for the chance to win over £7000 worth of prizes, including a £3000 cash prize. Lick Frozen Yogurt from Brighton, whose customers include Sainsbury’s, Waitrose and Tesco, were named as the third winners of the prize after impressing the judges with their plans for expansion into the gulf region and south east Asia. They won a £3000 cash prize, new website build and consultancy from Yell, and 2 free training courses from the Institute of Export. They also won, along with the other finalists, a £300 website translation voucher from SDL Managed Translation, 1 year’s small business membership at the Institute of Export and 1 year’s membership at Enterprise Nation. The finalists were chosen by our panel of judges having submitted their Export Action Plans using Open to Export’s online planning tool. The tool helps UK SMEs to create a structured plan for international expansion, covering all the steps of exporting from getting started to delivery and documentation. The finalists came from a broad range of sectors ranging from online payments to high quality syrups. Polkadoodles began proceedings presenting their fun craft products, kits and digital art and they were followed by Pasta Foods from Great Yarmouth, the UK’s only dry pasta producer and the first of four food and drink businesses. Finalists at the third Export Action Plan competition at Going Global. Alexandra Hargreaves, Head of Export for Lick Frozen Yogurt, then took the stage, impressing the judges with their plans for expansion into the gulf region. Lancaster Brewery were the next to present describing how new tax laws in the UK for the alcohol industry have made it more important than ever to look to exports for growth. The Ingenious Air Company then presented on their draft-free air conditioning offering for offices and homes. Following a break for lunch and networking, Flora Harrison presented her top quality brand of shoes and bags to the judges, bringing some extra glamour to proceedings. Premier Plant Hire presented on their plans to take their plant equipment, tool hire, storage and maintenance services overseas before Aude Dupont Dudley showcased her Blossoms Syrup brand of high quality syrups for restaurants and shops including 3 Michelin Starred restaurants and M&S. Asperato Payments finished the showcase with their flexible, multi-currency payment integration, rounding off an inspiring afternoon of exporter presentations. As ever with the Export Action Plan competitions, finalists were able to network and learn from each other and the judges, as well as seeing many of the exhibition stands throughout the bustling Going Global show. All the finalists told us of the importance and usefulness of the Export Action Plan tool for helping them create a structured and detailed plan for the next steps in their international growth. Lesley was joined on the panel by Phil Tobin, Managing Director of Bibby Financial Services, Peter Hughes, Head of Procurement Support Services at Heathrow, Julian Hucker, Chairman of Open to Export, and Ann Attridge, Director of Klik2Learn and a previous winner of the competition. The competition was sponsored by Bibby Financial Services, Heathrow Airport and Yell – both dedicated to helping more new and inexperienced exporters thrive internationally. Alexandra Hargreaves, Head of Export at Lick Frozen Yogurt. The competition will be resuming in 2017 as part of Open to Export’s ongoing efforts to help British SMEs take the next steps towards exporting. You can complete your Export Action Plan and take your next steps towards selling overseas at any time.